My friend, Vanessa, was having her birthday at a bar in the Annex last month. 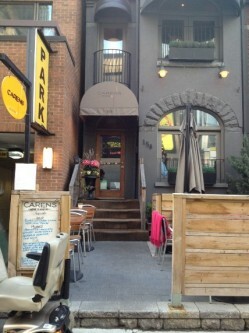 While looking for a place to eat nearby before heading to the bar, I came across Caren’s Wine & Cheese Bar in Yorkville. This wine bar is located on Cumberland street, just off of Avenue Road. It doesn’t have great signage so in case you’re looking for it, it’s situated between a parking garage and a sushi restaurant. 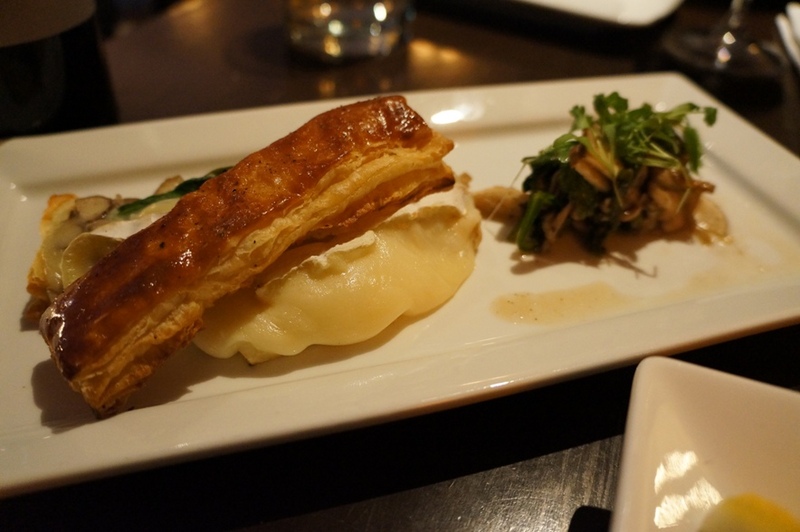 Upon entering the restaurant, I was pleasantly surprised by its quaint and intimate atmosphere. There’s limited seating on the main level so we were led up the stairs to the second level. The space has a very romantic feel to it, making it a great date spot. Given the name of the restaurant, it’s no surprise it has an extensive wine and cheese selection. Since we were heading over to the bar later, we only shared a bottle of wine and decided to fill up on some food so the night didn’t end up disastrous. 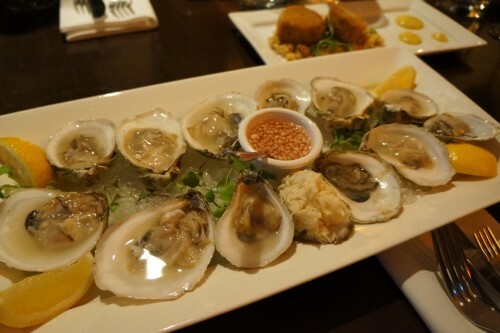 We started with some Oysters – freshly shucked with apple vodka mignonette and grated horseradish ($14). The order for $14 comes with half a dozen but since there were five of us, we got two orders. 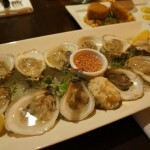 These oysters, which came from Rhode Island, tasted quite fresh and were a nice way to start off the meal. Next up was the Baked Brie – a light pastry & double cream brie served on a medley of mushrooms and spinach ($15). While it was something you could easily make at home, I thought the mushroom and spinach medley was nicely seasoned. 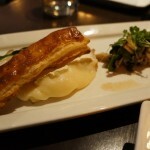 As for the rest of it… c’mon, it’s brie and puff pastry! What’s not to like? 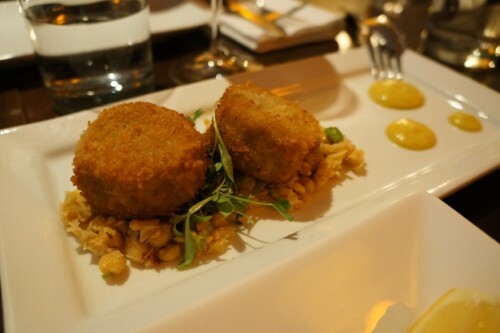 The last starter we shared was the Crab Cakes – pan-seared, on a bed of chickpea puree & mild curry aioli ($16). 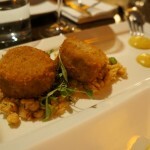 I found the crab cakes to be a little on the dry and crumbly side. I didn’t particularly care for the chickpea puree or curry either. I’d recommend skipping this appetizer. 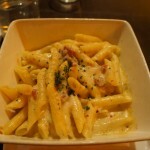 I opted for something carb-heavy – the Spicy Baked Mac & Cheese – penne with Sao Miguel, cheddar, swiss & parmigiano-reggiano in a spicy sauce ($16). You also have the option of adding prosciutto for $5 or lobster for $8. I decided to go for the prosciutto which came with a few measly cubes of prosciutto. Not worth the extra $5. 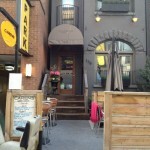 While it wasn’t bad, I just expected it to be better for a restaurant which specializes in cheese. 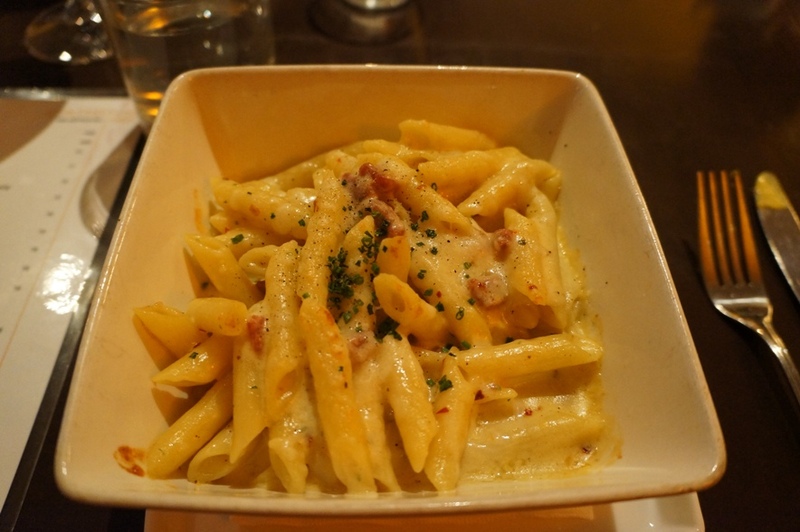 I still have yet to find a place which serves up a better mac and cheese than The Gabardine. 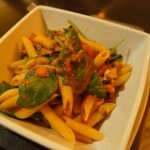 David decided to go with the Penne – Roasted chicken, chorizo, sundried tomatoes, mushrooms & spinach in a spicy tomato sauce ($18). I had a bite of his pasta and my thoughts of it were the same as the mac and cheese. Not bad but not great either. David also commented that the dish didn’t have very much meat either and he’s right. Can you see any meat? 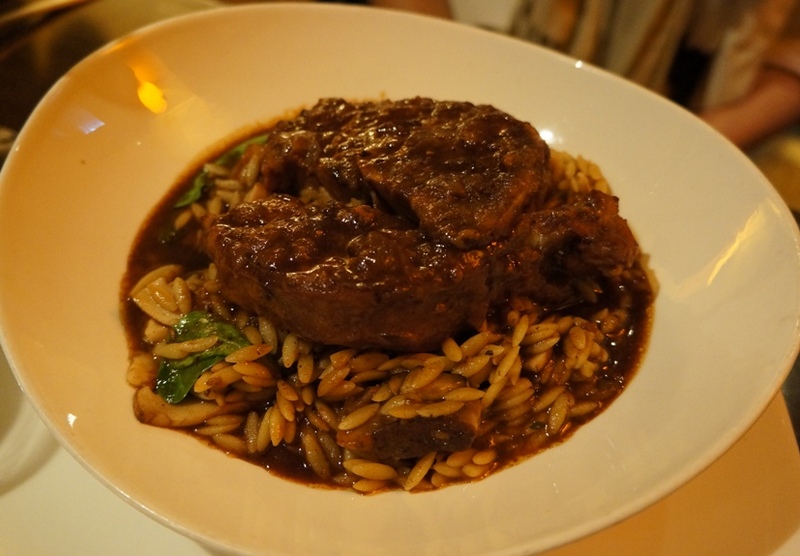 On the opposite end of the spectrum, Lina ordered the Osso Bucco Milanese – Braised veal shank with mushroom & spinach orzo pasta topped with gremolata ($27). 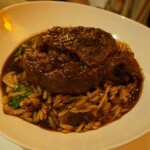 The dish came with an enormous veal shank sitting on top of a bed of orzo. 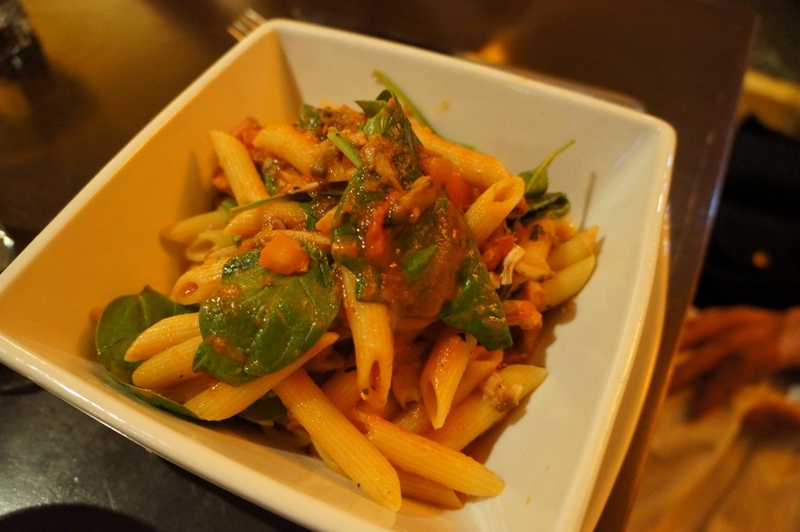 She said that while it was good, it’s not one of the best she’s had (she often orders osso bucco when she sees it on the menu). Overall, while I didn’t think the meal was anything special, I wouldn’t mind dropping by again since it has a nice, intimate atmosphere. I’d just stick to the wine and cheese.